This is my first Vibracathedral record and thanks to the recommendation of Eric from Tapedrift Records I bought this a couple of weeks ago. 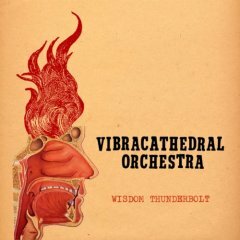 Vibracathedral Orchestra are a long running experimental/avant-rock band from the UK. Each of their records is recorded live in the studio which certainly gives everything on Wisdom Thunderbolt an improvised feel. When I first put it on I thought I was in for a stack of those meandering, kitchen-sink, Dead C type tracks and I’ll be honest the first track of Wisdom Thunderbolt does absolutely nothing for me. Self indulgence in experimental music often equate with a level of dullness. The opening track suffers as a result. So it was certainly a surprise when the second track “A Natural Fact” began. It’s an improvised swirling sub-continental ethno-drone track. It’s like some wonderful transcendent acid trip. It’s followed by “Order of the Broad Eraser” another transcendent track based around an ethnic drum beat that had me thinking of Sun City Girls. When the fourth track started the record was back in to the realm of drone and the improvised clatter of the Dead C although with greater focus and variety. One of the real stand outs is the fifth track, “Rainbow Whirlwind” which starts with that nauseating wonkiness that Black Dice do so well (I was thinking of “Snarly Yow” from Broken Ear Record). I first became aware of this band when The Wire did a “Invisible Jukebox” with Astral Social Club’s one member, Neil Campbell. Until recently he was a member of Vibracathedral Orchestra and I think this record is the second as Astral Social Club. I bought Neon Pibroch on a whim on Friday (I was looking for Grey Daturas but couldn’t find it) because it made The Wire’s best avant-rock list for 2007. I wasn’t sure what to expect really. My journey through this noise stuff is still relatively new. This record delivers three lengthy tracks which can fairly and accurately be stuck in the drone category and what Neon Pibroch basically delivers is drone for those who like a beat. The first track had me thinking more of electronica that some of their drone contemporaries. It’s like Birchville Cat Motel playing Chi Vampires at a summer Sunday afternoon rave. I have to admit that I’m pretty impressed. It makes me want to start exploring Vibracathedral Orchestra. Does anyone know where you start with that band?